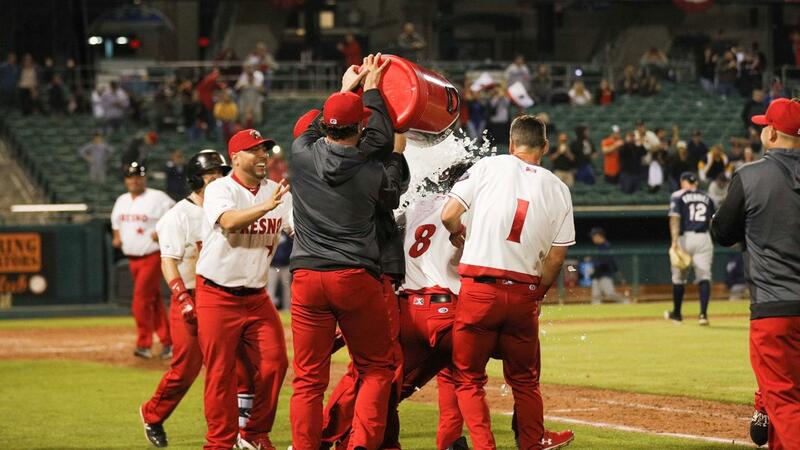 Fresno, Calif. (Thursday, April 4) - The final professional baseball game on the contintent to end Thursday night was well worth the wait for fans of the Fresno Grizzlies (1-0), and not just because of the post-game fireworks. Solo homers by Collin Cowgill (2-for-3, BB, 2 runs) in the second inning and Jacob Wilson in the fourth steadied Fresno on Pacific Coast League opening night, before Taylor Gushue came off the bench to deliver a game-ending, pinch-hit RBI single on a low line drive to centerfield to win it for the Grizzlies 5-4 over the Reno Aces (0-1) in the 10th with two outs. Matt Reynolds (2-for-3, double, RBI, run, walk) and Alec Keller (RBI single, game-winning run) also delivered run-scoring hits for the home side. After jumping to a 2-0 lead in the first inning on an Abraham Almonte two-run double, Reno rallied from a 4-2 deficit to send the game to extras thanks to a Kevin Cron solo homer in the eighth, and a Domingo Leyba two-out RBI triple in the ninth before Fresno's victorious response. Grizz lefty and MLB veteran Vidal Nuno (1-0) retired the side in order with three ground balls in the 10th, collecting the winning decision. Joey Krehbiel (0-1) was saddled with the loss for Reno. ON THAT FRES-NOTE: The Grizzlies are now 9-13 all-time on opening day, and 1-3 against Reno. A Giants-affiliated team dropped a 5-4 decision in 12 innings on April 8, 2010 on the road against the Aces (Fresno catcher was Buster Posey, 3-for-5, 2 runs), before a pair of Astros squads lost consecutive openers to Reno on April 6, 2017 (13-6 at Chukchansi Park) and April 5, 2018 (10-2 at Greater Nevada Field).